Hi i am size 16 so what size to select? I’m a big girl, like a 28. I ordered a 4x & it fits great. The material is stretchy, & skater dresses for me are always a plus b/c they provide extra room in the hips. Im' a size 16/18. I wear a 40DD. so I order a 2x most of them. Especially if it doesn't have any strech in it. This dress does have stretch. You can go with a Xl or a XXL that will be a bit longer im a 16 and i purchased a XXL its a bit loose but not too much! Good luck. It’s not made to be fitted and is a bit loose. So you could go with your regular size on this one. I would say 1x if you like a snug fit, 2x if you want a flower look. You can get a 1x but If you want it longer I suggests the 2x. HI! I would purchase a 1x. I think that would be a good fit. You can select 1X. I think will fit you perfectly. L or XL depending on if you want a lot of room. Hi u would need a size 1x would be fine. It has stretch so You should order a 1x. 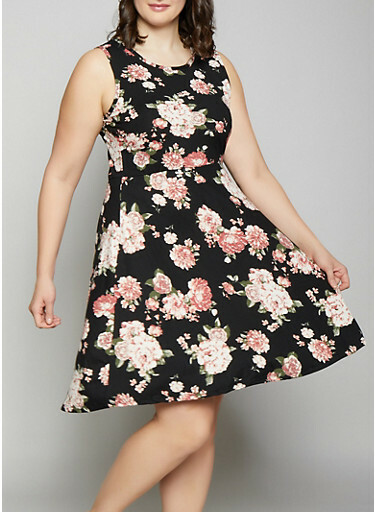 BEST ANSWER: The skater dress ran true to size for me. However, I am almost 6' so it was a little shorter (not much) than pictured, which I expected and matched with rose coloured leggings. So cute! Runs true to size, nice stretch! If you're in between sizes go up, it will lay nicely and not hide the belly. nope fits perfectly. it has a nice stretch to the material. No they’re true to size. With stretch. Beautiful fabric. I agree it runs true to size. No.. it's true to size..